This entry was posted on Thursday, September 8th, 2011 at 09:29 and is filed under Media, Politics, Sarah Palin. On Tuesday, at least two radio greats responded to the attacks on Sarah Palin by Laura Ingraham and Ann Coulter on Tuesday night’s edition of the O’Reilly Factor. If you missed either show, or the reason for these two patriotic hosts to get a bit exercised, you can see the video of the Fox broadcast here. Each of the radio talkers expressed it in their own way, but both noticed the clear hypocrisy implicit in the attacks on Palin by Coulter. 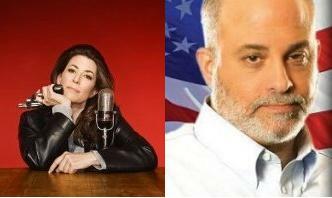 It’s no secret that these two, featured prominently in The Undefeated, both think the world of Governor Sarah Palin. Say what you want about either of them, but don’t expect them to shut up about the folks on the right who attack Palin any more than they’ll refrain from responding to the rabid left. It seems as though I’m not alone in picking up on the hypocrisy of Coulter in all of this. My own critics have complained I’m merely being a “crazed knee-jerk” Palin supporter, but if it leaves we Palinistas in the company of Tammy Bruce and Mark Levin, we won’t mind. Thanks Mark for putting these clips together. I've been so crazy busy I missed most of the responses. Now I'm caught up all in one place. I knew I could come here for reliable information and commentary. Thank you Rose! I try to shoot straight. Mark, I know I miss you in Miami!!! WIOD is NOT THE SAME without you, but I'm being more active as a result in supporting SARAH PALIN and Marco Rubio.